I think I may be the first ka-Bloomie to report back after seeing NYILY. It's a lovely movie. I enjoyed all of the segments, they were varied and interesting, some of them entirely different from what I had been expecting. I found myself wanting more of each one, they tended to end just when I was getting to know the characters and get a sense of the story being told. I was definitely left wanting more. Especially the story Orlando was in. He was adorable and sweet and his story was done way to quickly. I definitely want to see this movie again, it was full and rich and busy. If it had one fault, I would say that the emotional dynamics were very similar from one story to the next, there were no high or low points. We have seen it and we have really enjoyed it. Orlando's segment is so sweet. No need to say he is great. As always. The synopsis leaflet given in the theater has a big picture from his segment. Lovely! The Two Year Drought is Over! NYILY finally made its way here to Charlotte(and I thought I would have to wait for the DVD. ) I saw it this afternoon. Overall it was a good movie. Like others have said, some segments are better than others. My favorite non-Orlando ones were the Shia LaBeuf/Julie Christie(although I wish they had spoken a little louder as it was hard to understand some of what they were saying), the Eli Wallach/Cloris Leachman(You almost believe they are a real-life old married couple ) and Anton Yelchin/James Caan one(Good twist at the end). 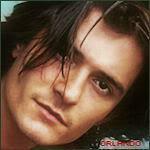 Now about Orlando: I wish they had done a whole movie on his character. His David is so adorable, charming even when he's grumpy. And of course he looked gorgeous. I love the bedhead and the scruff. And the montage at the end where they show quick shots of all the characters: That close-up of him smiling GUH . . I actually got NYILY on the first day of release from Netflix and I’ve been watching it since yesterday. I think I’m going to have to buy this one, because I really loved it. It’s sweet and poignant, intimate and subtle, funny, happy, sad; offers up sweet, sad smiles and silly grins. I love this concept of the little vignettes. They’re like a scrapbook--each page a place to pause briefly and appreciate snapshots of small moments in time. Tender slices of life strung together like a lovely strand of charming beads. I guess my favorites were the Natalie Portman ones – both the acted one with the Hasidic Jew and Jain characters and the one she wrote and directed about the little girl and her "manny" who was really much more. I think Robin Wright Penn is amazing. What a grand taste of the patchwork of cultures and neighborhoods, people and places that are New York City. It's like a Whitman's sampler of sweet surprises. It’s my personal opinion (after viewing his segment about 3 or 4 times) that Orlando’s at his best when he’s giving us intimate, subtle, real-life slices. No offense to marvelous, larger-than-life Will Turner, but I like him best when we get close-in portraits of him rattling on in a character through conversation or emotion or just thoughts flickering across his expressive face. Like Jimmy Connelly or Drew Baylor and now this one, David. He’s just… real. And very, very good. Even for just 7 minutes. Well, for me it's been a LONG not quite THREE years. Yep, as of May it would have been 3 years since I'd seen Orlando in something significant. I really love him, so that's much, much too long. I wasn't fortunate enough to attend his play in London, you know. Yes, I've seen the guest spots he's done. I've seen the charitable events he's attended and/or participated in. I've also seen the odd commercial or print ad here or there. If it's something featuring Orlando, then chances are I've seen it. Quite simply, I've more than likely seen them ALL. However. . . there's nothing like a movie starring our guy. Absolutely nothing. Maybe that's why I find myself once a week or so, sitting down to rewatch a movie of his I've already viewed multiple times. Well, I'm here to report that I was (finally!) able to see, quite early this morning "New York, I Love You", which I rented from Blockbuster. I knew that Orlando's part was short, I'd heard only 7 minutes, but I was still anxious to see him. I enjoyed the film and felt, like others, that each segment, while showing a slice of life in this big, famous city, was much too short. You found yourself caring about these characters and their lives. You found yourself wanting to know what happens next. You found yourself wanting to ask questions, knowing they'd go unanswered. I enjoyed the film, but kept having the same thought over and over again. I want MORE. Perhaps that's what the film's producers were going for. I may rent "Paris, je t'aime" to see if it gives me the same feeling. As for Orlando's segment, I found him adorable. He was scruffy and messy and frustrated. He was unkempt and unwashed and sick with a cold or something. He smoked too much, he talked on the phone too much, and his apartment was an absolute wreck. He was wonderful. Go see this movie, everyone. Seven minutes with Orlando is better than seven hours with anyone else. Trust me on this. Perhaps I'll be able to see "Sympathy For Delicious" and "Main Street" someday very soon? One can only hope. Pam, I agree with everything you said here and I have done the same things! In fact I have designated Saturday as my Orlando Movie Night and last night I started over at the beginning with Lord of the Rings: Fellowship of the Ring. So I keep hoping and praying I will be adding new movies to my Orlando Movie Night rotation. So I finally got to see New York I Love You, I rented it from Netflix and I absolutely enjoyed Orlando's segment and I felt the same way as you did Pam, wanting more. Those seven minutes with Orlando was just too fast, so when I was done with the movie, I watched his segment a few more times. As far as the other segments go, I like the one with Cloris Leachman, the one that Natalie Portman directed and the one she starred in. The only one I couldn't understand was Shia Lebeouf's segment, maybe if I had a chance to watch it a few more times I might understand it more, but it was definitely a much different part for him than he has done before. So all in all, I liked the movie. Also, I hope we both get to see Sympathy for Delicious and Main Street very soon and now we have The Good Doctor to add to the list as well. Truer words were never said. Seven minutes with Orlando is better than seven hours with anyone else. It is on Showtime now and I have to say it is pretty decent, for a "collabarative"(sp) movie. I have watched it three times and think some of the segments are so sweet! His is adorable and believable. It was not given a chance. And, of course, I LOVE New York City, so it was love at first sight.